[2Pac Japan.net] - "So Much Pain..."
Music From "Above The Rim"
95910-2 (USA Cd-S) I'm Still in Love With You "Al B. Sure!" 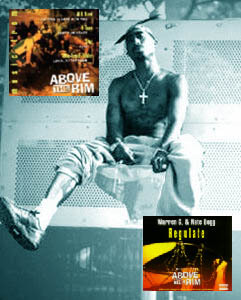 Loyal To The Game "2Pac/Treach/Riddler"
"Warren G & Nate Dogg"
6544-95896-2 (EU Cd-S) Regulate (Jamming Mix) "Warren G & Nate Dogg"
Regulate (Radio Edit) "Warren G & Nate Dogg"
Loyal To The Game "2-Pac/Treach/Riddler"
6544-95917-2 (EU Cd-S) Regulate (LP Version) "Warren G & Nate Dogg"
Mi Monie Rite "Lord G."
"2-Pac" Written by T. Shakur & R. Walker. Produced by Stretch. Mixed by Norman 'Slam' Whitfield, Jr.
"2-Pac/Treach/Riddler" Lyrics Written by T. Shakur, A. Criss, K. Gist, V. Brown and Riddler. Music Written by Reginald Heard. Produced by Reginald Heard for Durty Dawg Productions. Mixing engineer: Robert Chiarelli. Mixed by Cap't Curt.